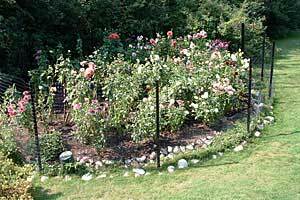 Standard Garden Fence Kits – Includes everything needed for a 3 1/2’ high barrier. Features heavy-duty black plastic fence fabric and Easy-Gate access. Available in 50’ & 100” lengths. Effective as a barrier to rabbits, skunks, dogs, and deer under certain situations. Deluxe Garden Fence Kits – Includes everything needed for a 3 1/2’ high above ground barrier plus a 6” below ground anti-burrow barrier. Features 4’ black vinyl coated metal fence fabric and Easy Gate access. Available in 50’ or 100’ lengths. Effective as a barrier to rabbits, skunks, dogs, woodchucks, and deer under certain situations.